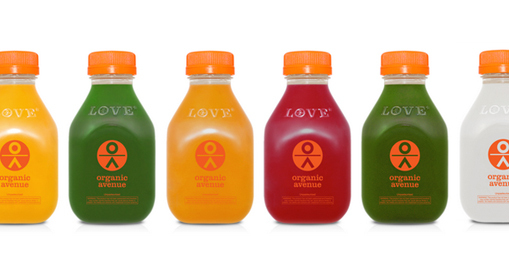 This week I did a 3 day organic juice cleanse called Love Deep from Organic Avenue. I wanted to do it because I get migraines and I thought it would be a good way to reset after the holidays. But the real reason that motivated to do it because a friend mentioned she was doing it and I thought it would be easier to do it knowing someone else was doing it with me. The cleanse itself was quite easy. I own a juicer and often times replace a meal with a juice but only consuming juice for 3 days was something I hadn’t done before. At first, I thought that I would just do a 3 day juice cleanse and make the juice myself. But, after considering the cost to buy all the ingredients and time it would require to make 6 juices a day (and clean my juicer 6 times) I decided that buying the cleanse was just as efficient and just as cost effective. I honestly felt a little guilty buying a cleanse when I owned a juicer. But, I was sold on the experience that Organic Avenue offered me as a consumer. It was a great lesson in the power of experience for a brand or product. Here are a few highlights of what I liked about the Organic Avenue cleanse and what I think could be improved from an experience perspective. Time savings: When I’m busy, I often say that I wish I could just have an IV of food so I didn’t have to think about what I was going to eat. In essence, the juice was my IV. Doing the juice cleanse made me realize just how much time I waste looking up recipes on Pinterest that I never make, making food shopping lists, doing food shopping, looking in the fridge and starting at food and thinking “what should I eat?”, and then the actual act of eating. Daily home delivery: When you sign up, you have the option to have the juice delivered daily to you or if you wish, you can pick it up from an Organic Avenue store. I loved the home delivery option. Frequency: The format of the cleanse is to drink one juice every 2 hours and for the hour you don’t drink a juice, you drink water or caffeine free tea. The spacing of the juices seemed like a long time. But on the first day when it was time to have another juice I was thinking “it’s already time for another juice?!?!”. Flavor: The juices each have a specific role in helping to cleanse your body and maintain your energy, so you get a nice variety of fruit, vegetables, nuts, and spices. You really realize how rich true flavors are and hopefully this helps to make your taste buds desire real food and not processed food. 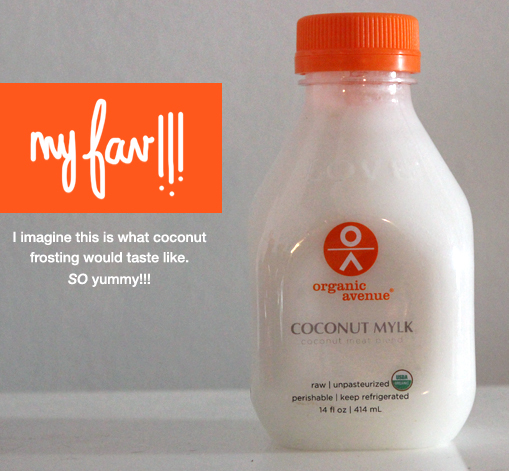 My favorite juice was the Coconut Mylk because it was rich and creamy and not too sweet. I texted my friend and said that it tasted like coconut frosting!!!! couldn’t get enough of this & sadly only got it 2 of the 3 days! Process & education: After I signed up for the cleanse I received 5 emails. The most important email was the actual instructions for the cleanse which tell you the schedule and times that you should drink the juice, very important information! When you receive the box of juices each morning, it does come with a packing slip and tells you the order in which you drink the juices, but it doesn’t include the time! So, I was constantly going to my email and bringing up the email of instructions to see if it was time for another juice. Of course, I could have printed the email. But from a user experience perspective, it would have been nice to have the instructions and times on the packing slip. The packing slip: Organic Avenue has a great brand, but the packing slip looked like it was printed from a spreadsheet! It was so boring and didn’t evoke the brand at all. There’s so much that could be included on that packing slip to encourage and educate me. I think this is a good reminder that when creating an experience, you have to consider every single touchpoint and what you can do at each touchpoint to improve the experience of your consumer. Numbering the bottles: Each bottle is clearly labeled with the name of the juice, which corresponds to the packing slip. But, it would have been friendly to simply number the bottles. Tote bag: On the Organic Avenue website, I read about the insulated coolers that the juices arrive in. They must have recently changed how they do things because my juices came in a cardboard box with an ice back. I wish that on the first day I would have also received a tote bag or something to carry the juices in. I found myself using a small Lululemon bag to carry the juices in because I was concerned the juices would sweat in my purse! A tote bag would have been useful to me, but also would have helped me be a brand ambassador. So many people asked me about the cleanse and I think 4 people I met for drinks (well, sparkling water and lime) last night are signing up today. If I had a tote bag, they could have seen the Organic Avenue logo and the iconic orange color that evokes the brand. Rate the juices: It would have been really cool for me to rate the juices. 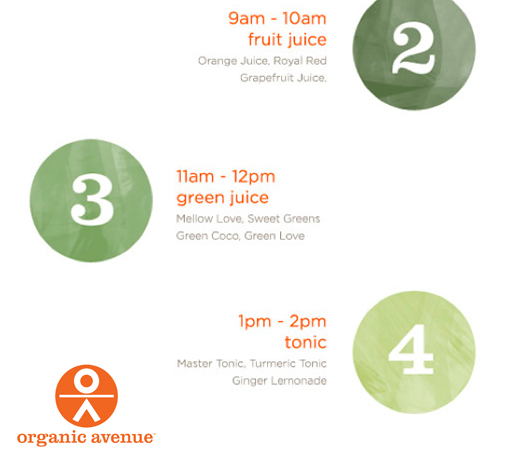 Maybe at the end of the day Organic Avenue could have sent me an email to give feedback on the juices. I gladly would have done this!!! Encouragement: People cleanse for a lot of reasons, but I’m guessing that a lot of people are interested in a bit of education around what the juices do and why certain ingredients are used. Also, since it’s my last day on the cleanse, I have questions such as “what should I eat for breakfast on my first day off the cleanse”. Some type of email communication would be super helpful to my experience. Community: My friend and I did the cleanse together and throughout the day we texted each other to see how we were felling and if we liked the juice of the hour. But, if I didn’t have a friend doing it I would have felt very isolated! It would be cool for Organic Avenue to figure out how to integrate more of a community into the cleansing experience. Overall, I loved it and would definitely do it again. But, the user experience designer in my couldn’t help but think about how this experience could be made even better. Have you done a juice cleanse before? What do you think worked or didn’t work about your experience? PS: Organic Avenue did not pay me to do this post, and I paid for the cleanse myself!